Happy 2016, everyone! The calendar says it’s January, but until recently Mother Nature hasn’t noticed around here. I am not complaining when I say that until this week we’ve only had a few days below freezing. 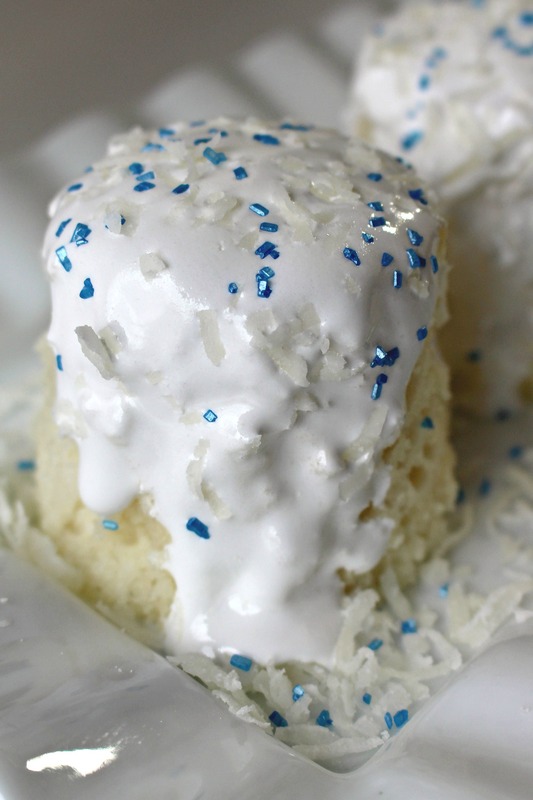 As a matter of fact, I am delighted that the only snowballs around here are this 3-2-1 Coconut Snowball Cake! Snow is beautiful to look at, but no fun to drive in. I am not a skier and have no one at home hoping for a Snow Day off from school (though my daughter, a teacher, has been known on occasion to do a Please Let It Snow dance). So, really, I have no use for the stuff. I like living where there is a change of seasons, but prefer mild changes. That probably makes me sound old. My energetic Sheltie insists that we spend a couple of hours outside every day regardless of the weather. The winter cold temperatures are his favorite. He adores snow. I own multiple layers of dog park clothes and boots so that I can accompany Pax on his outdoor adventures. Even without snow and ice, the cold weather makes me crave a mug of something hot every time I walk in the door. What better to accompany that coffee/tea/chai/hot chocolate than an individual serving of cake? And even better if that sweet treat can be ready to enjoy in just one minute! 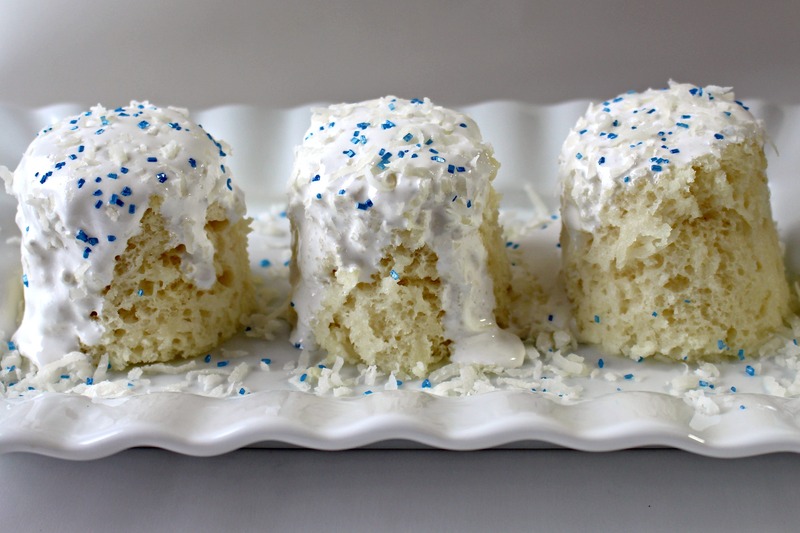 Like most of the 3-2-1 microwave mug cake recipes on The Monday Box, 3-2-1 Coconut Snowball Cake starts with the “magic mix” of one box of angel food cake mix and one box of flavored cake mix. This recipe uses white cake for the flavored mix. To make one mug of cake, 3 tablespoon of the “magic mix” and 2 tablespoons of water are combined right in the mug. 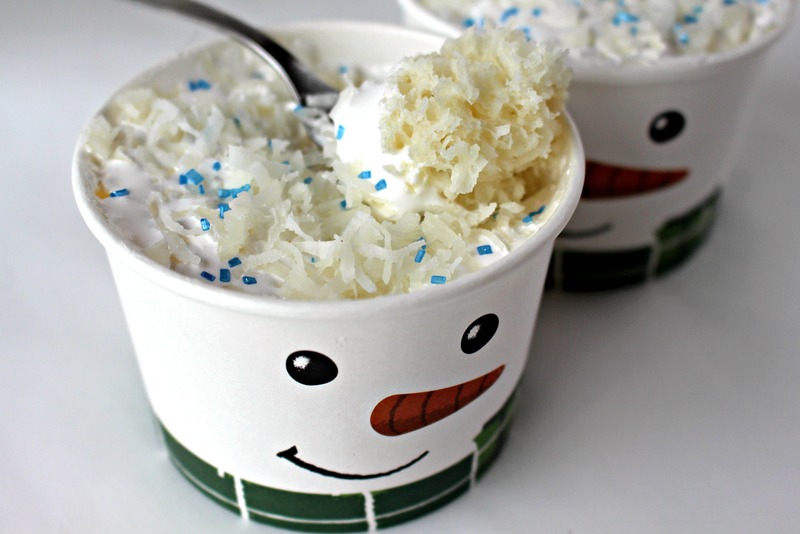 A tablespoon of sweet cream of coconut and shredded coconut flakes are added to the mix. One minute in the microwave produces a cup of moist coconut cake which is then topped with one or two tablespoons of marshmallow cream and a sprinkling of more shredded coconut. A warm cup of indulgence. 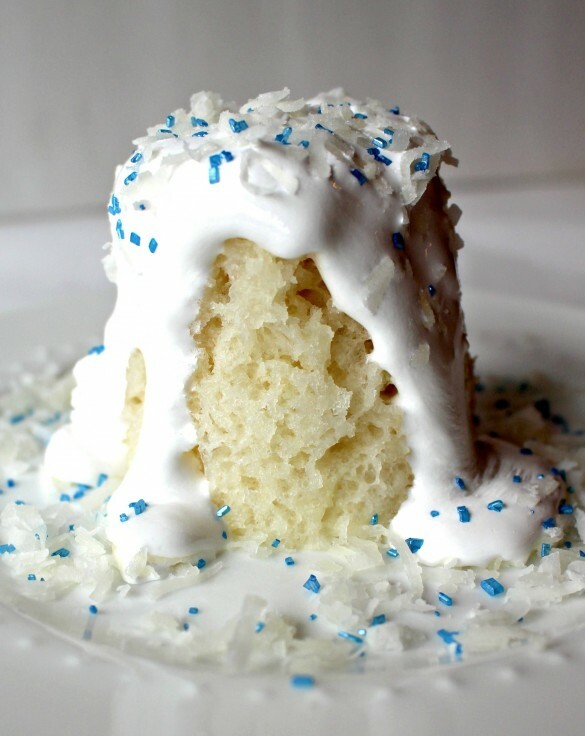 There are many benefits to 3-2-1 Coconut Snowball Cake over real snow. This microwave mug cake is sweet, and delicious, and goes well with any cozy beverage of your choice. Snowflakes are fun to catch on your tongue, but don’t taste great. Snow doesn’t ship well, nor can it be stored easily in a kitchen cabinet. The ingredients for 3-2-1 Coconut Snowball Cake, on the other hand, are shelf stable and make a great winter care package. Plus, 3-2-1 Coconut Snowball cake only requires a spoon or fork for shoveling…..into the nearest mouth. (Here comes the 3-2-1 part) Into the prepared mug, stir together 3 tablespoons of cake mix and 2 tablespoons of water. Mix in a tablespoon of coconut and a tablespoon of coconut cream/syrup. Immediately place 1-2 tablespoons of marshmallow cream on top of the cake and allow to sit a few minutes until melted. 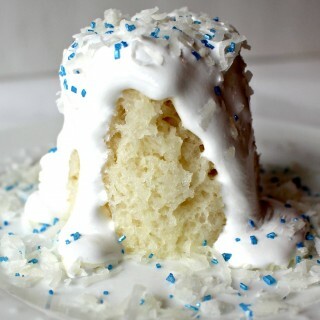 Sprinkle the top of the cake with a little coconut and a dash of colored sugar. Then eat the cake right out of the mug. If you want to transfer the cake onto a plate, run a knife around the edge between the cake and the mug to loosen, dump out onto a plate, then add the marshmallow, coconut, and coconut colored sugar. Combine the two cake mixes into a labeled gallon-size ziplock bag. 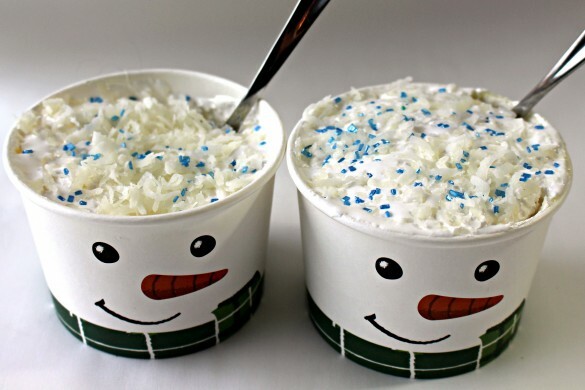 Include a measuring spoon, a bag of sweetened shredded coconut, a can/bottle of coconut cream/syrup, a jar of marshmallow cream, and blue decorating sugar. If the care package is international, include microwave safe paper cups. If the care package is domestic, add either a can of non-stick spray (for use with a ceramic mug) or microwave safe paper cups. Don’t forget to include a copy of this recipe! I’m with you, sister friend… I am not a snow fan. I am, however, a fan of anything with coconut, cake, and if you throw in the word easy I’m your best friend. This looks delightful. Thank you for posting, Wendy! Thanks, Liz! These 3-2-1 cakes are kind of like an updated version of Easy Bake Oven. Even your boys would find them easy! Where did you get the cute cups for your cakes? I just “adopted” a sailor through Soldiers Angels, and am excited to find out if she has access to a microwave and would like some 3-2-2 fixings in a care package! Who wouldn’t want some of your 3-2-1 cakes…have to have their head examined! Thanks, Paula. 🙂 I am glad you are still reading this post because I wanted to tell you that I found “treat cups” 6-packs with stripes and polka dots by the same brand as the snowman in the $1 section at Target today!! You will be seeing them on a future 3-2-1 post for sure. I think they will be great for a spring, summer, or Easter care package. Another wonderful winner! So pretty – I love the presentation 🙂 snow or not – I could enjoy this anyway too! Pax has the right idea – a little exercise and little treat. Have a great (snow free) week! This is such a pretty 3-2-1 cake Wendy!!! The weather has been so bizarre by us too – it was so warm over Christmas and then a few days ago below freezing. Can’t make up it’s mind!! Thanks, Ashley! Pretend snow (especially if its cake and marshmallow snow) is the best kind. 😉 The weather here is St. Louis has been in the 20’s one day and in the 50’s the next! Bizarre weather everywhere, I guess!